In the heart of the city, National Museum Cardiff has grand halls and gallery spaces; conference, breakout and catering facilities, as well as a 300 capacity auditorium for performances and launch events. 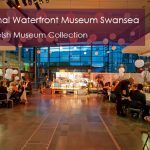 Whether you are looking for classic, contemporary, or quirky: if you book the National Museum’s facilities for your event, conference or special occasion, you’ll be supporting the venue’s work safeguarding the treasures of Wales. The art collection at National Museum Cardiff is one of Europe’s finest. See five hundred years of magnificent paintings, drawings, sculpture, silver and ceramics from Wales and across the world, including one of Europe’s best collections of Impressionist art. Situated in the heart of Cardiff’s elegant civic centre, it houses Wales’s national art, geology and natural history collections as well as major touring and temporary exhibitions.